I thought I'd write a little document showing my initial thoughts on the latest release of AutoCAD and configuring it to suit user preferences. 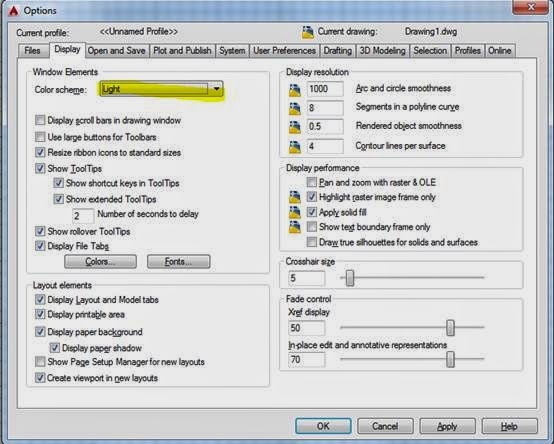 This includes setting AutoCAD 2015 to a more classic layout if desired and the discovery of a few little quirks and bugs that may frustrate some. It has been my experience training AutoCAD users over the years that on the whole they are a pretty conservative set of users who tend to hate change especially when the changes seem to be for changes sake. Of course we should embrace new productivity benefits to ease the process of drawing. But I suspect over the coming months we're going to get calls and queries to get AutoCAD to look how people like it. The old maxim ‘if it ain't broke’... etc..
As you are no doubt aware Autodesk are in the process of releasing their 2015 set of individual products (although at the time of writing the suites have yet to be released). 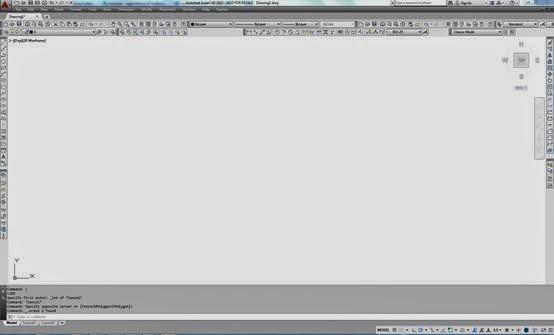 AutoCAD full and the LT version now defaults to the dark display of ribbons. Which allegedly makes it look similar to other products in the Autodesk range, reduces user eye strain and is better suited to hardware accelerated graphics. However, personally speaking and taking a quick straw poll of some veteran users no one liked the new look. I was asked if it were possible to revert to a more conventional display i.e. a lighter themed ribbon environment to which the answer is a thankful yes! Go into OPTIONS and click on the display tab. Other AutoCAD improvements are much more worthwhile in my opinion including a command preview function which shows how certain commands are going to perform. With regards to TRIM, the element half-tones, indicating which half of the element will be removed from the drawing. Similar improvements have been applied to other commands such as OFFSET, FILLET and CHAMFERS. Not jaw dropping but nice nevertheless. A new SKETCH selection tool has become available with clockwise yielding a crossing sketch and anti-clockwise a window sketch. Very nice to those people who have to work with drawings with colleagues who insist on exploding hatches or dimensions! This can be accessed by executing a command and upon the Select Object Prompt; Press and hold down the left mouse button and drag the cursor accordingly. Other enhancements are an improved help environment which shows an animated arrow from the help screen to the relevant command. Also enhanced is the display and optimisation of 'point cloud' data. Another casualty of the 'improved interface' is seemingly the loss of the button configuration for 'ORTHO', OSNAP and DYN etc... The icons have been relocated next to the Annotative buttons and we at the time of writing seem to have no way to revert to the classic 'wordy' buttons. In my view the buttons seem a bit small and similar which was my problem with this part of the interface in past releases. Certain buttons have been added such as ISOPLANE.. Seriously? Who is doing manual isometric drawings these days when we have such incredible tools in the Vertical AutoCAD’s, Inventor and Revit. Of course the buttons can be customised as in, be turned off or on but I think this is a classic case of a change initiated by a 'non' user. The old function key shortcuts still work however and AutoCAD has thankfully retained the 20 ways to do most things concept. The new Ribbon interface has always been a bit of a hot potato with the AutoCAD user community. Personally I think it is great and I believe it aids new users in learning the 'dark secrets of CAD. However amongst us there are Toolbar enthusiasts who will no doubt be annoyed at the removal of the Classic AutoCAD workspace. Fear not! we can bring some (but not all) classic modes back. Firstly ensure that any changes made to your CAD environment can be saved to your work space. (small cog wheel button in the bottom right hand corner). Then customise environment to suit, turning off any toolbars that are not needed. Whilst not being my AutoCAD environment of choice it does look reasonably close to the old AutoCAD 2008 environment, which a significant number of users prefer to work with. An annoying feature, or is it a bug seems to have manifest itself with the 2015 release.. Even with the appropriate options selected for snapping to elements in a hatch object. For some reason the intersection snap doesn’t work although the other Snaps do! This will be a real pain to people working on grids (ceiling or floor). Autodesk has been made aware of this issue, we can only hope that a workaround or fix is found soon. The only way around it (and it is a limited workaround) is to use the Object Snap Tracking feature using multiple Endpoint snaps to find projected intersections. In summary I feel the 2015 version of AutoCAD is more of a 'consolidation' release, some good features overall, but the Hatch snap 'bug' is an annoyance that should have been caught at the Beta stage in my view. Still Autodesk are reasonably quick to apply updates, all I can say is post on the Autodesk forums or on the Cadline Community where we will do our best to alert the development team of the problem and advise on any updates on this and other issues.